"Certainly you will not be interested in continuously effecting a patent infringement, which may involve the most serious penalties to the infringer and his customers"
"The letter undoubtedly constituted a threat to sue Sudarshan. But, as both parties accepted, this is not actionable because Sudarshan is the maker and importer of the product complained of, and s.70(4) [of the Patents Act 1977] makes clear that proceedings may not be brought for a threat in respect of its activities. The question to which this aspect of the appeal gives rise is whether the letter also constituted an actionable threat to sue Sudarshan's customers. Sudarshan says it did because it conveyed to Sudarshan that Clariant intended to sue its customers. Clariant says it did not because a threat must be communicated to the person threatened. Further, the scheme of the 1977 Act is to permit threats to be made to the primary infringer, and that is just what happened here: the threat was communicated to Sudarshan".
" ... A threat to sue a manufacturer in respect of his own activities is one thing. In a culture which encourages parties to discuss their differences before going to court, that is something with which he may be expected to cope. But a threat to sue his customers is quite another. A manufacturer may be very fearful of the damage this would cause to his goodwill and customer connection and so prefer to cease manufacture and sale altogether. A patentee may of course be prepared to sue the customers and if he does so the manufacturer must take the consequences. But Parliament may well have thought it wrong that if the patentee is not prepared to do so, perhaps because he knows it will damage his reputation too, that he should nevertheless be permitted to secure a commercial advantage by telling the manufacturer that that is what he intends to do". Crocker Enterprises Ltd v Giordano Poultry-Plast SpA is an extempore judgment of Mr Justice Mann (Patents Court, England and Wales) last month involving conditional fee arrangements and the transfer of proceedings between the expensive Patents Court and the cost-capped Patents County Court (PCC). In short, Giordano -- the defendant in patent and design infringement proceedings brought by Crocker -- applied for the proceedings to be transferred from the Patents Court to the PCC. Giordano, which had its own patent and design rights, denied infringing and challenged the validity of Crocker's patent on lack of inventive step, among other grounds. This action had not got very far before Crocker asked to amend his claims so as to include a claim for revocation of Giordano's patent and, back in March 2013, just before the change in the costs regime for patent litigation in England and Wales which effect from April 2013, Crocker entered into a conditional fee agreement (CFA) with its solicitors. Once the regime change took effect, Crocker gave notice to Giordano of the CFA and applied for a directions hearing. In response, Giordano applied for the proceedings to be transferred to the PCC where, because of cost capping, the uplift under the CFA might not be recoverable if Crocker succeeded. Said Giordano, the financial value of the claim was small, the case was not legally or technologically complex, it was agreed that the trial would last two days and in all the circumstances the case was fit for the PCC. Giordano also submitted that the parties were on an unequal footing since Crocker had entered into a CFA just before the regime change. Crocker disagreed: the case was not as simple as Giordano said it was -- and if it was transferred to the PCC there would be constraints on the production of evidence that would curtail Crocker's ability to advance its case. * The patent issues appeared relatively straightforward and were the kind of issues with which the PCC was well equipped to deal. However, there were also design right claims, and these added an extra layer of complexity. The PCC could be expected to deal with those issues, but they meant that the case could not be considered as straightforward. * Crocker had begun the action in the Patents Court and wanted to continue there. This was a significant factor to be weighed in the balance. A party had the opportunity to proceed in the PCC in an appropriate case if it so wished but, if a claimant wished to proceed in the Patents Court and the case merited it, that option should not lightly be taken away. * The CFA had been properly entered into and Crocker was entitled to expect its case to be dealt with under the old costs regime and in the Patents Court. Transfer to the PCC would result in capping, which would be unfair when Crocker had chosen the benefits of proceeding in the Patents Court under a CFA since the costs cap was unlikely to be lifted. * The criteria for a transfer order were set out in the Civil Procedure Rules, CPR r.30.3(2) and the main factor in favour of transfer was the low value of the claim. However, that was outweighed by the issues of complexity and the unfairness of ex post facto cost-capping. This piece is based on a LexisNexis note. SDL Hair Ltd v Next Row Ltd and others; Master Distributor Ltd v SDL Hair Ltd and others  EWPCC 31 is an interesting Patents County Court, England and Wales, decision on infringements and threats which emanated last month from Mr Recorder Richard Meade QC. With so much going on, it got overlooked at the time -- but it's still worth noting. Essentially this action concerned two separate though connected cases and turned on two issues. One case related to SDL's heated hair rollers. MDL sued SDL and six other defendants, for infringing UK Patent GB 2 472 483. The second concerned SDL's claim that it had received letters that conveyed wrongful threats of patent infringement regarding the patent. * Did MDL even have status to sue for infringement at all? MDL said it was suing as an exclusive licensee under section 67(1) of the Patents Act 1977 -- but the patentee was continuing to deal in patented goods at the same time. Was that fact inconsistent with MDL having a legal right to exclusivity? * Was the patent infringed? Everyone agreed that the heating in SDL's products depended on the current draw of the heating unit with a particular size of roller in it, and on the fixed heating time of the products. * Were various letters which MDL sent SDL "groundless threats of infringement proceedings" under section 70 of the Patents Act, one of which was from MDL's solicitors and specifically mentioned patent infringement? * Was Alan Howard (Stockport) Ltd -- the second-named defendant company in the infringement action -- the importer of the SDL products that it had bought? If that was the case, then threats made against that party would not be actionable by virtue of section 70(4) of the Act. As to whether Alan Howard (Stockport) Ltd was an importer, it appeared that shipping was arranged and paid for by SDL's Danish parent company, ID Hair Company -- in which case, if Alan Howard (Stockport) Ltd wasn't the importer, a threat against against it would be actionable. * Starting with infringement, the judge saw no inconsistency between a patentee continuing to deal in patented goods and the grant of an exclusive licence. On the facts there was a real licence, not a sham: on its face it therefore complied with sections 67 and 120(7) of the 1977 Act. The fact that the patentee continued to deal in the patented goods was irrelevant. It followed that MDL was an exclusive licensee and was therefore entitled to sue. * Since it was common ground that the heating in the SDL products depended on the way the current of the heating unit is drawn with a particular size of roller in it, and on a fixed heating time, neither of which involved a signal derived from monitoring the roller, neither of SDL's products infringed. * On the evidence, the combination of ID Hair Company paying for and arranging transport and the risk remaining with it until the goods reached the customer was enough to say that it and not the customer -- in the this case, Alan Howard (Stockport) Ltd -- was the importer. The judge managed all this with just two hearing days. The case provides yet another reminder of the need to be cautious about writing to an alleged or suspected infringer without incurring liability for making unwarranted threats. 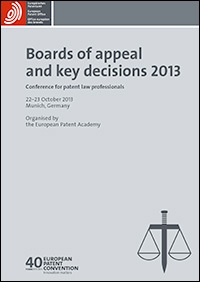 Our good friend and reader Yonko Borisov (Conference Consultant/Academy, EPO) has just told us that registration is now open for the European Patent Office's Annual case law conference - Boards of appeal and key decisions 2013". Says Yonko, this conference provides a unique opportunity to meet numerous chairmen along with legally and technically qualified members of the Boards of Appeal. Participants will learn about the Boards' recent key decisions on late filings, among other enticing topics. For the first time ever, a mock trial will be held to convey the subtleties of a hearing. Guest speakers include the delightfully lucid Geertrui Van Overwalle from KU Leuven and Klaus Grabinski from the German Federal Court of Justice (Bundesgerichtshof). This week the Advisory Council of the U.S. Court of Appeals for the Federal Circuit published a second proposed pre-trial order for use in patent cases. (The first proposed order, dealing with e-discovery issues, is available HERE). The newest order attempts to streamline issues in patent litigation by limiting the patentee to 16 claims asserted in a case, and limiting the accused infringer to 20 prior art references asserted as bases for invalidity. In addition, the claims and references must be selected relatively early in the case, within 28 days from the court’s claim construction order. Cases with over a hundred asserted claims and over a hundred asserted prior art references during discovery are common. The identification of an unmanageable number of products can be a problem too. Lack of discipline by the asserting party in preparing its case is often why excess issues are maintained. The inclusion of superfluous claims and prior art can function to “hide the ball.” The result is an asymmetric burden on the responding party (and the trial court) because the asserting party often has a better sense of which issues it will ultimately pursue. Excess issues, unsurprisingly, inflate litigation costs. Each unnecessary asserted claim and prior art reference must be analyzed and charted, among a myriad of other unnecessary case-management tasks that follow. These attorney chores generate disputes, frequently unrelated to the merits, which unduly burden the judiciary. The per-case resources a busy judge can afford to invest in a patent case is only a fraction of what the parties and their law firms are willing to expend. Focusing patent cases to the issues at the core of the dispute will reduce the burden on courts and lower the expense for the parties. In addition, a greater focus on the true issues will improve the quality of the adjudicatory process for all. The complete model order, with commentary, is available HERE. 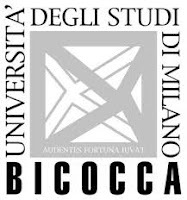 Italy has committed itself to the Unified Patent Court, even though it has declined to join the unitary patent system. What might this mean in practice for the profession in Italy? 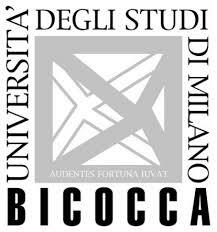 Some answers to this question may be obtained from a forthcoming conference at the University of Milan, the details of which can be obtained from Professor Costanza Honorati. Recently published in the Journal of Competition Law & Economics (2013) 9 (2): 285-311 is an article, "Injunctions for Standard-Esential Patents: Justice is not blind". The authors are Peter Camesasca, Gregor Langus, Damien Neven and Pat Treacy . I'm not familiar with the first three authors but the fourth, Pat Treacy, is a partner at Bristows who has long specialised in areas of interface between IP and competition law and who is also a founder member of the Editorial Board of the Journal of Intellectual Property Law & Practice (JIPLP), which I edit. "Leading competition authorities such as DG Competition (“DG COMP”) and the U.S. agencies have recently expressed concern about the potential for injunctions to be used by owners of patents declared essential to a standard (SEP) to extract excessive royalties from licensees (that is, hold up). This was a central issue in the agencies' review of the acquisition of Motorola Mobility by Google in 2011, following which DG COMP opened investigations against Samsung and Motorola Mobility in early 2012 to assess whether these companies may have abused some of their essential patents. This article aims to contribute to the debate on the merit of the availability of injunctions for SEPs. We address the perception that the current system contains inadequate protection for licensees against the risk of hold up on the part of SEP owners through the application for injunctions. We provide an overview of court procedures currently in place across key jurisdictions and argue that the risk of hold up is overstated and that serious consideration should be given in the policy debate to the risk of reverse hold up by the licensees before contemplating change. Importantly, our analysis takes into account the possibility of opportunistic behavior by prospective licensees. This feature has been noted before but not explicitly modeled so far." If this article is of any interest to you and you are not a subscriber to JCLE, you can still purchase short-term online access to it via the journal's website here. Virgin obtained judgment from the English Court of Appeal (“the CA”) against Zodiac for damages to be assessed for the infringement of certain claims (“the relevant claims”) in a European Patent. The CA found their patent to have been valid and infringed by Zodiac. Subsequently, the Technical Board of Appeal (“the TBA”) of the European Patent Office (“the EPO”) ruled that that the relevant claims were invalid because they had been anticipated in prior art, and retrospectively amended the patent so as to remove, with effect from the date of grant, all the relevant claims. Virgin submitted that it was nevertheless entitled to recover damages for infringement because the CA’s conclusions - that the patent (including the relevant claims) was valid and that the relevant claims were infringed by Zodiac - were res judicata as between it and Zodiac on the subsequent assessment of damages, and that it was not open to Zodiac to reply on the TBA’s amendment to the patent, as this would be inconsistent with the orders made by the CA. That argument had succeeded before the CA in similar circumstances in previous cases, and the CA had followed those decisions in the present case. Zodiac’s case is that the unamended patent has been retrospectively amended, and that the relevant claims therefore no longer exist, and are deemed never to have existed. It submits that no issue of res judicata arises because that was not the situation considered by the CA. The Supreme Court unanimously allows the appeal and declares that Zodiac are entitled to rely on the amendment of patent in answer to Virgin’s claim for damages on the enquiry. Lord Sumption gives the lead judgment, Lord Neuberger gives a concurring judgment, and the other members of the Court agree with both judgments. After a review of the law of res judicata [17-26], the Court gives two related reasons why Zodiac cannot be precluded from relying on the decision of the TBA on the enquiry as to damages. 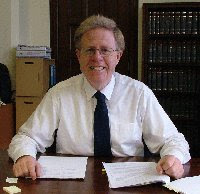 One is that it is relying on the more limited terms of a different patent which, by virtue of the TBA’s decision, must at the time of the enquiry be treated as the one that existed at the relevant time, whereas the unamended patent, relied on by Virgin, must be treated as if it had never existed. The second reason is that Zodiac is not seeking to reopen the validity of the relevant claims, which was one of the questions determined by the CA. The invalidity of those claims may be the reason the TBA amended the patent, but Zodiac is relying on the mere fact of amendment, not the reasons why it happened [27, 53, 54]. The CA reached a different conclusion because it followed a line of cases holding that a patentee, whose patent (in proceedings against a particular defendant) is found to be valid and infringed, is entitled to claim damages from the defendant for the infringement without regard to a subsequent revocation of the patent, even though as a matter of English law the revocation of a patent for invalidity relates back to the date of grant [28, 48]. The Court holds that this line of cases was wrongly decided. Their major fallacy is the assumption that cause of action estoppel was absolute generally rather than absolute only as regards points actually determined by the earlier decision. Accordingly, the decisions in those cases had no regard to the fact that the consequences of the patent’s subsequent revocation had not been, and could not have been, determined, or even taken into account, in the earlier decision, because it had not happened by the time of that decision. They were also wrong to suppose that, by taking into account the subsequent revocation, a court would be rehearing the question of validity decided by the judgment on liability. The revocation was a decision in rem determining the status of the patent as against the world [32, 48]. It had been revoked by the authority which had granted it and it must be treated as never having existed. The issue raised on the enquiry was not invalidity but revocation . Accordingly, where judgment is given in an English court that a patent (whether English or European) is valid and infringed, and that patent is subsequently revoked or amended (whether in England or at the EPO), the defendant is entitled to rely on the revocation or amendment on the enquiry as to damages . The Supreme Court also proposed that the current procedural guidelines laid down by the CA, which propose that the English court should normally refuse to stay its own proceedings if it would be likely to resolve the question of validity significantly earlier than the EPO, should be re-examined [38, 69]. Lord Sumption's judgment states that the major fallacy of the previous line of cases was the assumption that cause of action estoppel was absolute generally, rather than absolute only as regards points actually determined by the earlier decision. Since the consequences of the parallel revocation of a patent could not have been decided in these cases prior to the damages inquiry (since it had not happened), there was no true cause of action estoppel. The inquiry would not be asked to rehear the question of the validity of the patent – rather deal with the consequences of its revocation ab initio. ... this decision applies to the subsequent revocation of a patent both by the EPO and in England. It therefore applies not only in cases with equivalent facts to the Virgin case (parallel UK and EPO proceedings between the same parties), but also where two parties separately attempt to revoke a patent and only the later action is successful (as in the Coflexip case). The Supreme Court heard argument on the comparable position in other European jurisdictions [an increasingly frequent practice, in keeping with the spirit of judicial comity which has recently spread though the European IP judiciary] but did not rely on comparative law in its decision. Whilst it appears that there is no consensus across Europe, this decision brings UK procedure closer to that in Germany, where restitution is available, and into line with the position in France (where damages which have already been paid are not recoverable, but revocation of the patent prior to payment will extinguish the right on which the patentee bases his claim for damages). ... this decision does not impact on the general rule that, whilst a successful claimant is entitled to pursue an inquiry for damages even if there is a possibility of an appeal, He usually does so at his own risk as to costs if the decision on liability is reversed on appeal. The situation in Virgin only bites once the appeals process has been exhausted, i.e. there is a final decision on liability. In addition, this decision does not change the position where a damages enquiry has been concluded before the patent is revoked. In this case, the final judgment for damages will only fall to be challenged on appeal, if an appeal is still open. Once the damages have been paid, the infringer would need to bring a claim in restitution to seek recovery of the amounts paid. This is one of the reasons why the Supreme Court has asked the lower courts to review the procedural guidelines which currently suggest that English Courts should normally refuse a stay if the English Court would be likely to resolve the question of validity significantly before the EPO. Patent litigation survey: can you help? Considering my keen interest in IP, I have chosen my dissertation topic to be based on the impact of the Lord Justice Jackson's Civil Costs Review on IP litigation in England & Wales. As the reforms are still fairly recent, I believe that obtaining empirical data from IP practitioners would add tremendous value to my research work. Please assist me by completing the survey and, if you see that there is something that I should be aware of in this particular area of research, please also kindly alert me to it. This survey is designed to get your views on Lord Justice Jackson's Review of Civil Litigation Costs (the Jackson Reforms) and their relevance to intellectual property litigation in England and Wales. The questions cover the key reforms mostly relevant to the Patents County Court. Thank you very much for your co-operation and support. Click the link to enter Kingsley's Jackson Reforms Survey.